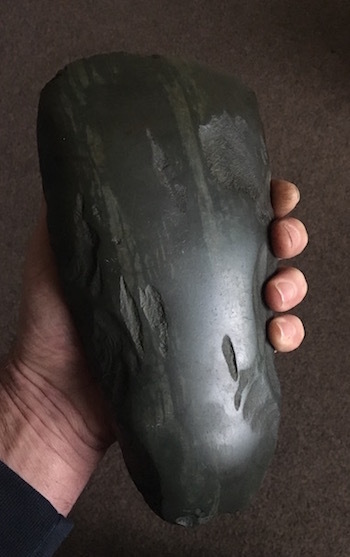 I saw this axe come up for sale so on a whim put a bid on it and was surprised a low bid got it - i wasn't sure when i bid if it was genuine as the pictures weren't to good but when it arrived i couldn't believe how big it was - the rock is like flint and rings when tapped - its really heavy - after hand polishing an axe i can see all the signs of it been genuinely hand polished on a stone - and the shape / knap marks point to this. would love to know where the material came from - its similar to the Langland Tuff but much darker. is it British? 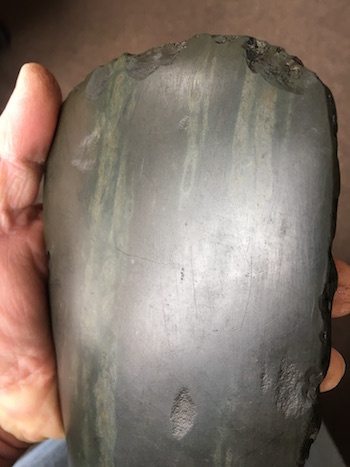 If so it may be from the Langham Axe factory which used green stone. However green stone was common throughout the world. I saw some Saharan African ones on Ebay that were green. I read somewhere Langdale alone had 250 axe working sites. I doubt anyone has ever done such a survey. Seems a lot, especially in Wales. Too dark for Great Langdale (volcanic tuff), try Papua New Guinea. A damn nice axe though, and a good bid.